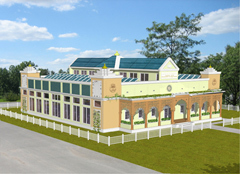 "Green" building that's under construction at Maharishi University. A new classroom and research building is under construction on a college campus in southeast Iowa that aims to set a new global standard for green buildings. David Fisher, director of the Sustainable Living program at Maharishi University in Fairfield, says the building promises to be unlike any other structure on the planet. Banks of solar panels will provide the electricity for the Sustainable Living Center, Fisher says, and solar energy is being used by workers during the construction phase, as well. During the warm months, he says the building will be kept cool using a geothermal system. “The heating will be done with solar water heaters on the roof,” Fisher says. “We will have insulation provided in part by very local materials, that is compacted earth blocks which came from some earth right across the street that was being cleared out for a parking lot.” That dirt was compacted into 26,000 bricks that will make up the building’s insulation. The building’s skeleton will use whole tree post and beam techniques. Fisher says the building is designed to meet the Living Building Challenge, the highest standard for sustainable design and green building in the world. It will also be the first to combine that standard with the standards of LEED Platinum certification, Building Biology and Maharishi Vedic Architecture. The building will serve as the base for the university’s Sustainable Living major. It will have classrooms, a workshop, a meeting room, a greenhouse, a kitchen, a research lab, a recycling center and offices. Fisher says it’ll be a building that teaches. The one-point-seven million dollar project is expected to be complete late this year.